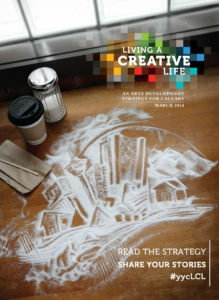 Vision: Calgary is regarded as a world-class city because its artists, arts organizations and presenters import and export the highest quality of work on regional, national and international markets. Outcome One: Calgarians benefit from experiencing world-class art presented locally. Driver: Support and strengthen arts events and organizations that present national and international artists, performers and productions as part of their mandates. Examine the barriers to presenting the work of national and international artists to inform and advocate for possible solutions. Create and support large-scale arts events that specifically showcase world-class art. Driver: Ease the process of importing artistic work from outside the city. Establish a strong network of Western Canadian presenters that can work together to create attractive touring opportunities for national and international artistic work. Train Calgary arts organizations in how to navigate the customs system and import international talent. Number of artistic works presented and number of visiting artists in Calgary. Volume (number of articles) and tone (qualitative nature of articles). Outcome Two: Made-in-Calgary artistic work has a high profile outside the city and is often found on tour in other regions, provinces and countries. Driver: Raise the profile of our outstanding local artists and arts organizations. Encourage national arts critics and media outlets to visit Calgary and provide informed criticism of our artists and arts organizations’ work. Train Calgary artists and arts organizations in creating “export-ready” products that attract tourists from outside the city limits. Driver: Ensure that artists are included in trade missions at the municipal and provincial levels. Encourage partnerships that increase the prevalence and prominence of Calgary’s artists and arts organizations at international arts exhibitions, festivals and trade shows. Create opportunities to host and attract international presenters to Calgary to scope out our local talent. Driver: Ease the touring process for Calgary artists and arts organizations. Work with the public and private sectors to create new funding opportunities for touring. Facilitate memberships to international organizations that promote artistic exchange. Number of Calgary-produced artistic works toured outside of Calgary.